ShammingSituation: Book Review - The Prince Of Patliputra by Shreyas Bhave. 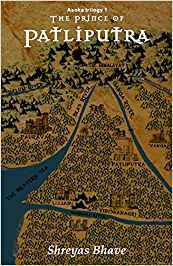 Book Review - The Prince Of Patliputra by Shreyas Bhave. "272 BC BHARATHVARSHA, LAIID OF THE ARYAS Samrat Bindusar, son of Chandragupta and the second Samrat Chakravartin of all the Aryas rules over the massive subcontinent from his holy seat in Patliputra. Almost five decades ago, his father had laid the wealth and glory of the past has subsided. As the Samrat's health continues to decline due to an unknown illness, problems are arising all over his realm. There is infighting and rebellion. No clear successor to him is present. Ninety nine of his sons stand in line waiting for his throne. Bharathvarsha needs a Chandragupta once again. And it needs a Chanakya too. Can the young Prince Asoka, who is the least favorite son of the Samrat, fill the boots of his grandfather? Can Radhagupta, a mere Councilor of the Court be what Chanakya was to all the Aryas? Begin a new adventure with the first book of the Ashoka trilogy as you read to find the answer to one great question- That who shall be the next Samrat of this holy land of the Aryas? " REVIEW : The book revolves around the two majestic figures of indian history-bindusara and samrat chakravartin,who have been instrumental in shaping the indian history. The book takes us through the time when their respective dynasties needed a political reform that would register their names in the golden pages of human history.the book is filled with extremely inquisitive incidences as several questions are answered while others are left unaswered. The characters of the book provide an insight into the day -to day scheming and political discussions that formed the backbone of the two most credible dynasties of india. As compared to the textbookish history i felt the one explained by Shreyas is exemplary and made me understand the characters really well. The narration is very lucid and comprehensive and the vocab included can be understood by all the readers easily. I just felt that a sequel is needed to make some concepts a lil clear in my head, otherwise the book is amazing and should be picked up by all the mythology lovers across the world.